Just like its larger siblings, the two-cell Bravo and three-cell Charlie, the Alpha features a modular design allowing up to 24 different configurations based upon different combinations of switches, bezel rings, and lenses. Prices range from $130 to $179 depending upon configuration with custom engraving available for an additional $10 fee. This review is based upon the A112 (Standard bezel ring, standard lens, click tailcap) and A321 (Crenelated bezel ring, flood lens, rotary tailcap) versions of the Alpha. Both arrived in plastic clamshell packages which provide a full view of the lights and displays the assorted ratings, tested according to the ANSI FL1-2009 standard. Each package also includes a single Battery Station 123A primary battery (installed in the light) and a pair of O-rings which can be used for additional retention when weapon mounted with an Elzetta tactical flashlight holder. The Alpha has a three-piece design consisting of the tailcap, body, and bezel ring. All parts are machined from 6061-T6 aluminum with a matte black hard-anodized finish. The 1” (nominal) diameter body follows the same general design as previous Elzetta lights with exterior knurling and deep grooves to provide grip. The anodized finish is evenly applied with no defects and the laser etching is clear and legible. Unlike previous Elzetta lights, the head is integrated into the body and is not removable. The business end of the Alpha is finished off with a removable aluminum bezel ring, available in smooth or crenelated versions, which provides protection for the front of the light and the user-replaceable lens. Unscrewing the bezel allows the acrylic lens to be removed and exposes the Cree XP-G2 emitter. O-ring seals are used to maintain a water tight seal between the body, bezel ring, and lens. Unlike the larger AVS head, the lens and white plastic holder are snapped together and come out as a complete assembly. Replacement lenses will come already installed in their own holder. Rotary Tailcap – Press for momentary operation and release for off. Twist (tighten) for constant-on. Click Tailcap – Partial press for momentary operation and release to turn off. Full press (and click) for constant-on and click again to turn off. Alpha High/Low Tailcap – Functions the same as the Click tailcap except it allows a lower 7 lumen output mode by twisting (loosening) the tailcap a fraction of a turn. Each of the push-button style tailcaps features Elzetta’s distinctive “Z” embossed into the low-profile switch boot. Made of harder rubber than most other switch boots, the Elzetta tailcaps require more deliberate pressure to operate, reducing the possibility of inadvertent activation of the light. All switches operate silently, including the Click, High/Low, and High/Strobe. 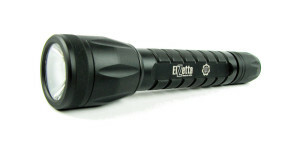 The Alpha-specific version of the High/Low tailcap (not shown) is laser engraved on the end to distinguish it from the version used with the other Elzetta lights. The High/Low tailcap used with the Bravo and Charlie will work on the Alpha, providing a VERY low level of output. Elzetta runtime ratings are in accordance with ANSI FL1-2009 which considers runtime until output drops to 10%. As a company, Elzetta has always favored optics over traditional reflectors in order to create a broad beam for improved peripheral vision. The Alpha is no exception and indeed produces what many would call a “floody” beam, even with its standard lens. In general the beam has a more neutral tint than the AVS heads and color rendition is better than average. When illuminating nearby surfaces, the standard optic does produce a noticeable center hotspot but at distances beyond 6 to 8 yards, it becomes more of a “hot area” rather than a spot with intensity tapering towards the edges of the very broad spill beam. In my usage the center portion of the beam was effective slightly beyond 40 yards. When equipped with the flood lens, the Alpha literally produces a “wall of light” illuminating everything within reach with its smooth and even beam. Obviously this spreads the same amount of light more evenly across a much larger area and the effective reach is less than half that of the standard lens. 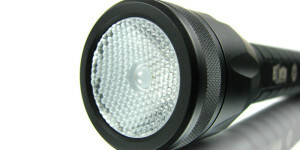 The following slides compare the standard and flood lens versions of the Alpha to a variety of other lights to provide some perspective of output and beam profile. The beamshots can be compared across the full width of the image using the slider and additional images can be accessed by using the navigation buttons in the bottom-right corner of each image. The Alpha is rated to produce its full output of 315 lumens when powered by a single CR123A lithium primary battery. Elzetta explicitly recommends using only USA-Made CR123A batteries as they are the only ones that meet their standards for safe and reliable operation in critical situations. The Alpha will support the use of rechargeable LiFePO4 and lithium-ion cells but these should be used only in non-critical applications. The 100% value in this chart is equal to the Alpha’s initial output (measured 30 seconds after activation) when powered by the recommended CR123 lithium primary battery. In this configuration, the Alpha maintained at least 70% of its initial output for the first 44 minutes before beginning to decline more rapidly as the battery was depleted. Output reached 10% of initial output after 56 minutes of operation, exceeding its advertised claim of 51 minutes. The Alpha was still producing a usable amount of light after 80 minutes of operation when the test was ended (not shown on chart). The light became warm over the course of the test but was never hot or uncomfortable to hold. When using the higher voltage rechargeable cells, the Alpha demonstrated noticeably higher levels of output and considerably shorter runtimes. Unlike the primary CR123 battery, the rechargeable cells provide zero warning prior to being depleted, with output dropping rapidly (with the LFP123) or shutting off completely as the battery’s protection circuit kicks in. Operating temperatures became quite high during continuous operation, particularly when powered by the AW 16340, making the light somewhat uncomfortable to hold. The runtime chart illustrates just one of the reasons why rechargeable cells are not recommended for use in critical situations. Having a light suddenly shut off may not be a big deal when walking the dog but could be catastrophic in other situations. As with all runtime charts, this reflects constant operation with a fresh battery until it runs flat. Real world results will be different, depending upon usage. 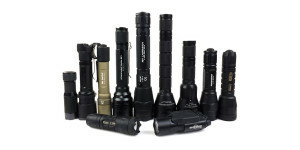 The introduction of the Alpha rounds out the Elzetta family of flashlights which now covers all the bases for lights powered by 1 to 3 CR123 batteries. The ability to swap tailcaps, aside from the High/Low, with the entire family of lights is a bonus for current Elzetta clients allowing them to reconfigure their own lights based upon their needs. The Alpha shares the same over the top construction as the Bravo and Charlie and may even be more durable, if such a thing is possible, due to its one-piece head/body design. On the performance front, the Alpha produces a good amount of light for a reasonable amount of time although its output is not regulated as tightly as the AVS head used with the Bravo and Charlie. When powered by a CR123 primary battery, the decline over the first 45 minutes is less obvious during actual use than on a runtime chart. The long tapering decline that follows will allow plenty of warning of the need to change batteries, switch to a backup light, or disengage. Although not totally unique, the Alpha does have a different beam profile than many people are accustomed to and its output may seem underwhelming due to the lack of a piercing beam and long reach. However, the Alpha was designed with EDC and close quarters combat in mind with the emphasis on a very wide beam without an overwhelming hotspot. The Alpha is not for everyone but those who need it will appreciate it. 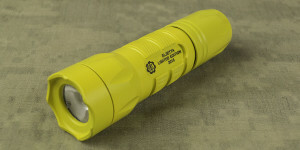 When equipped with the standard lens, I would consider the Alpha to be a good “general purpose” light suitable for the bulk of tasks where a flashlight is required. It is easy to use in tight areas, such as indoors, without concern of bright reflections off of nearby surfaces and provides good peripheral vision with the broad spill. Of course the flood lens offers the ultimate in spill and seems perfect for close-in task lighting or for use when searching a person or vehicle. To support the EDC role of the Alpha, Elzetta has also released their new Speed Clip which may be installed without the use of tools on any Elzetta flashlight. Designed to allow bezel-up or bezel-down carry, the Speed Clip consists of a hard nylon collar and a stainless steel wire clip. The wire clip seems to be well suited for positioning the light within the pocket and is works well for “quick draw” applications. The collar has roughly the same diameter as the Alpha bezel and can also serve the same purpose as the combat ring found on other flashlights. When the Alpha is carried in the bezel-down position it is very easy to withdraw with the middle and index fingers around the collar, immediately placing it in a cigar-hold. I will do a separate mini-review of the clip once I have had the opportunity to use it more with the other Elzetta lights. Taken as a whole, the Alpha provides a nice alternative to other tactical style lights on the market with its comparatively low intensity beam and will work well for anyone looking for a very tough and compact light that won’t blind them during close quarter activities. As with all Elzetta products, the Alpha is made in the USA using American labor, tooling, and materials. Additional information about the Alpha can be found on the Elzetta website. 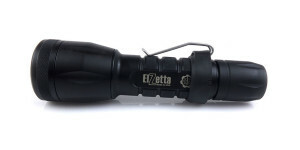 Posted in Elzetta Reviews, Flashlight Reviews and tagged Elzetta, LED Flashlight Reviews. In view the graph of runtime, I’m not going use rechargeable batteries. This the lamp going to serve me for my EDC and my night-hikes (in addition to the EB1T). You’re welcome Dan. Thanks for reading it! 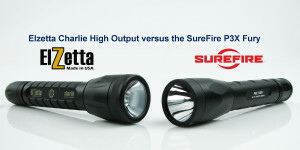 I agree that it is better to live with the lower output and longer runtime when carrying the Alpha as an EDC light. It complements the EB1 very well as they each have their strengths. I found the speed clip to work better if i installed it on the tail cap instead of the body. When its installed on the body the light wanted to stick out of my pocket more then i liked, plus it would snag on things. Sets deeper in the pocket and doesn’t snag when placed on the tail cap. Love the light and clip combo. As always keep up the great work, love the reviews!! Just purchased a ZFH1500 for a Colt M4 and found the mount fits loose on the barrel causing mount to pivot approximately 1/4 inch. Are there adapters for barrel mount. Hi Richard. I’m afraid I don’t know anything about the Elzetta weapon mounts but I will try to get a response for you. You could also contact Elzetta directly. There is an e-mail link in the bottom-right corner of their home page. Great review and testing. Thank you! I would love to see a runtime chart using the primary and rechargeable batteries in low mode. I know ..it is easy to ask, hard to do. Great review! I just ordered an Alpha and it should be here Friday. It will be my first Elzetta and I’m pretty excited to see what all the fuss is about. I have the Bravo AVS and I love it. Two things I don’t like about this light. The light simply does not have enough throw to be useful. To me the regular head looks like a flood Lens. This could be fixed with a better TIR optic. The other thing really isn’t something to dislike. The LED In this light is out of date. Time for an upgrade Cree XPL. I have the Alpha with high low tail cap and speed clip and I everyday carry it. I love it, It is plenty of light with good beam projection for most tasks. The only time the battery wore out while using it was when I had to change a tire on a rental car on vacation. Being unfamiliar with the rental vehicle it took a bit to locate the jack, tools and procedure for changing the tire in the dark. Fortunately I brought spare batteries and was up and going in no time.